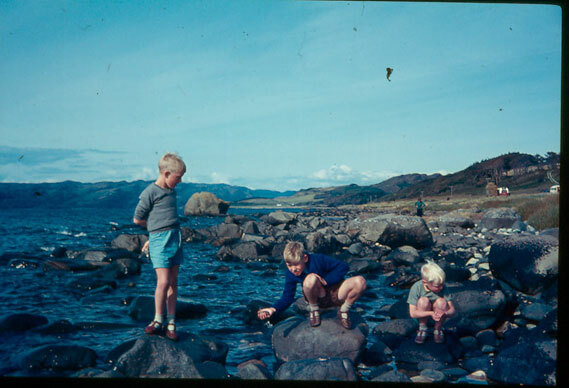 1964, in a quiet bay on Loch Melfort an injured Shag moved awkwardly.Three brothers approached cautiously, for both their own and the bird’s sake. 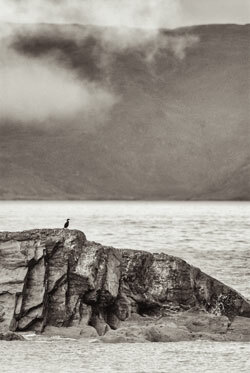 They could touch, stroke and closely observe it in a way that gave real meaning to all those other birds of the Scottish Lochs and hills they had encountered, the ten o’clock Buzzard and the Herons that, in the same fashion as the Shag, suggested to them something pre-historic. It was to be a defining moment for the youngest of the brothers, aged just six. 1. Description. – Length, 27 in. 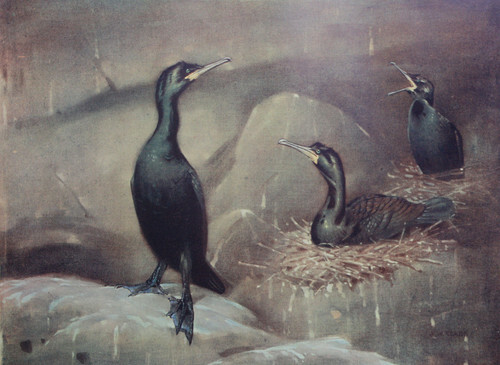 Resembles Cormorant in general appearance, but has only 12 tail feathers, is decidedly smaller, and has dark green head, neck and under parts. In spring a curved crest is assumed on the forehead. Male larger; iris green. Young birds have very slender bills; upper parts brownish green; under parts brownish ash, mottled with brown. This bird book accompanied us along with a couple of others on our holidays in Scotland. It was first published in 1930 but we had a ‘modern’ re-print from 1966. The linking together of the plate, the description and ‘our’ bird was the hook, and I wanted to do it again and again with other birds. Another book that we had with us was the ‘Collins guide to Bird Watching’, by R.S.R. Fitter in 1963. It wasn’t for a six year old but it hinted of what the subject was all about and how much information there was on it, I remember the feeling of excitement of what lay ahead. We also had a copy of ‘The Oxford Book of Birds’ by Bruce Campbell and Donald Watson. This was more like it for a youngster beginning to feel excited about birds, it was more of a guide and showed the birds in a little of the context you could expect to find them in. The Shag is also a bird you find on the coast, generally fishing further out than Cormorants and not frequenting estuaries or inland lakes so its romance also lies, for me, in location and habitat as well as within the bird itself. It would be forty years before I would begin to actively photograph birds, but during these intervening years ornithology was always my way to relax and experience the world birds inhabit and to wonder at their extraordinary comings and goings. I’ve never lost that initial feeling I had when we came across that Shag. Birds continue to inspire and confound and now I’m trying to capture some of this excitement and energy I have felt when in their company through photography. This essay was posted on December 21st, 2012.